Two-thirds of the way through the workshop and I am exhilarated and exhausted! On day 10 we had some very challenging physics questions to tackle. The first involved a box on a ramp (what we physics people call an inclined plane problem). The second involved the Atwood's Machine - and half or modified Atwood's Machine (what we physics people call a two-body-problem). The day started with a discussion of the readings from Arons. The reading was about the common vocabulary of physics with regard to "gravity". In our modeling class we don't use the word "gravity" at all; in fact I call it the "g-word" and don't let anyone use it! There are much better ways to refer to things kids usually call "gravity" and Arons goes into detail in this section. I couldn't agree more with Arons and we talked all about our own conceptions and his observations. We then embarked on the ramp problems. After 4 years of leading a workshop (and 15 years of teaching) I still don't have a great way to get students or teachers to discover or construct on their own how to draw a force diagram for a box on a ramp. It is very frustrating. So I, instead, wanted to see if I could somehow link what we were doing to this new process. Earlier in the workshop we had referenced a section of the Arons reading where he suggested a flashlight demo to help students resolve vectors into their component parts. Take a meter stick to represent a vector and lean it against a wall. How would you know how long to make the horizontal and vertical components. Arons says to take a flash light and shine it parallel to the floor and on the wall you'll see the vertical component. Then take the flash light and shine it perpendicular to the floor and you'll see the horizontal component. Our participant have really embraced this idea and have even gone to calling the components the "shadow arrows". So the question is how does one draw the component vectors for a box on a ramp? Traditionally we were told to just "rotate the axis" and then break up the weight vector into its component parts. But this instruction was given without a reason or context. It was, "just the way you do it". So I practiced and got good at it but never really knew why. And I want at least a little more for the participants. To find the components shine the flash light parallel and then perpendicular to the surface. This rule gives us a reason to "rotate the axis". Since the flash light is orientated according to the surface even if we tilt the surface we can still find the shadow arrows! Moreover, these arrows have to be, themselves, parallel and perpendicular to that surface. In the end the participants still had to practice. But I am more comfortable giving them a little more than this is "just the way you do it". Unfortunately I had to show them how to do it, which isn't the end of the world. I don't mind doing an "on the board" demonstration if it is a particular skill I want them to master. While finishing, one of the participants asked, "how do you convince the students the angle of the ramp is the inside angle of the component triangle?" I was like, "I try never to show them anything they can figure out on their own!" So I asked them to use the method I just described and then measure the two angles and see for themselves. 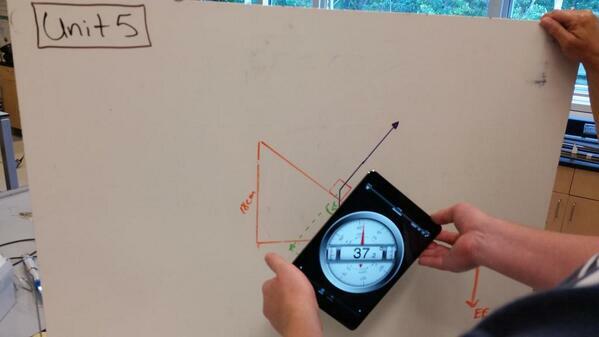 The engineering group above used a bit of technology (my favorite app called "clinometer") so measure the two angles. Other groups used protractors or those giant Plexiglas triangles from geometry class. The point is, nobody is confused about the fact that those two angles are the same. No geometry necessary; convincing needed! Then they practiced. This basically took all morning. Ugh. Learning is so slow when it is meaningful. We then moved onto the dreaded Atwood's Machine problems. These again are tough for almost all physics students. Why? It is hard to say. Probably because you have to think about two objects instead of just one. But is that really that much harder? Apparently so. As teachers we need to practice our RETROGRADE AMNESIA; remembering back to a time when you didn't know or know how to do something. Do you remember back to when you didn't know how to tie your shoes? Do you think you could effectively and easily teach that skill to someone without remembering what that feels like? It is the same with these problems! The issue, again, is traditionally we were told how to do these and just practiced until we got it right. This involved drawing a force diagram for each object and then writing a sum of the forces statement for each. This would yield two equations and two unknowns. Then from there we do some math-magic (also known as algebra) and solve for something; the tension in the string or the acceleration. Kind of tough for all but the best students (who are probably just following the procedure without thinking too much about it anyway). Can we do better? What kind of construct can we apply to this problem that is a bridge between what we already know and this new situation? We decided to go for a system approach for the modified Atwood's Machine. We started by drawing a force diagram for each body and then asking the question, "What is the role of the pulley?" I suggested that it was to turn the force 90 degrees. What would the force diagram look like if we undid the pulley? Can we then smush the force diagrams together to find the unbalanced force? Once we had the unbalanced force and mass for the system we could then find the acceleration of the system. This procedure allows us to simplify the large problem into something manageable. The participants, however, had to make that cognitive leap in order to get on board with this idea. Not too many had a problem and we made sure to work with them and that they had enough practice. The day ended with a practicum challenge. They were given a Modified Atwood's Machine and asked to release it and a buggy at the same time so that the little mass on the end of the string landed in the buggy. The group that was the closest landed it on the hood. I didn't assign any homework because it was the 4th of July weekend.